This bug also affects the Java edition; see MC-1133. 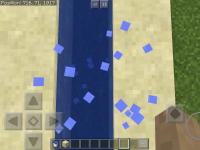 Upon falling/sprinting on a block which is situated next to a block of water, one would expect the particles formed under the player to take on the texture of the full block as is done when the non-full block is air. 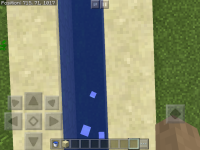 However, if the player is situated at a point where they are still standing on the block, but more of the player is above the water block, the textures of the water block will instead be used. Start sprinting, or fall into this position. 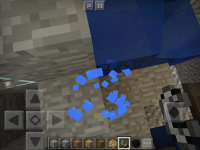 The particles produced below the player will use the textures of the water or lava blocks instead of that of the solid block the player is actually standing on.